Elk Grove mayoral candidate and incumbent Steve Ly has continued his robust fundraising activities in the lead-up to his November showdown with Tracie Stafford and Darren Suen. In his most recent California Form 460 financial disclosure filed with the Elk Grove City Clerk's office recorded on Friday, September 28, Ly report donations totaling $95,229, off which $15,437 was in-kind donations and the balance, $79,792 was cash. Including donations reported for the six month period ending June 30, Ly's year-to-date total through September 22 is $220,513, of which $202,513 in cash. 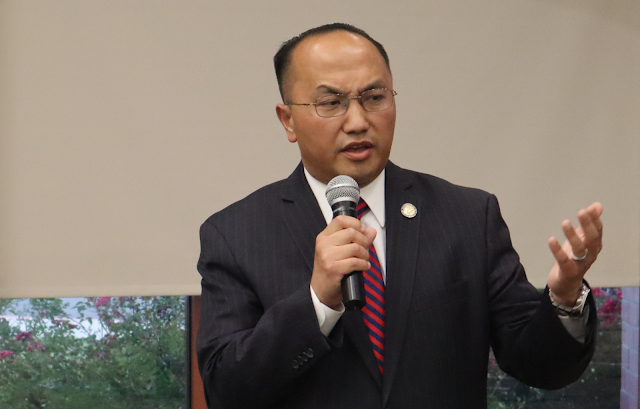 In paperwork submitted to the Elk Grove-South County Democratic Club endorsement proceedings earlier this year, Ly estimated the cost of his campaign could approach $450,000. Among Ly's largest contributors were the California Conference Board Amalgamated Transit Union Small Contributor Campaign of Oakland who gave $5,000. Another perennial supporter of Ly, the Plumbers and Pipefitters Local 447 in Sacramento donated $2,000. Although Ly appears to be losing the contest for contributions from real estate developers with business interests in Elk Grove who have supported him in the past to Suen. However, Ly has tapped a large network of out-of-state business and individual contributors who appear to be shoring up his finances. Of those listed donations, which typically range from $100 to $500, 57 were from Wisconsin; 25 from Minnesota; three from Colorado; and two from Michigan. Ly reports cash on hand as of this report at $172,173. Of notable expenses listed, Ly paid Tyson Shamus Sorci, who is also one of his city-paid assistants, $2,120 in mileage and campaign consulting services; $1,460 to Big Oak Nursery, Elk Grove; $1,200 to Bangkok Post restaurant, Appleton, Wisconsin for fundraising activities; and $3,000 to Political Marketing International, Marianna, Florida, which according to it's website "has been providing automated calls since 1998 for political candidates, campaign consultants, PAC's and organizations for polling and various other applications of automated calls."